"The variety sunflower is a miniature version of the larger, more common sunflower. The petals range from pure yellow to spashes of rusty brown. A delightful addition to any garden." To learn more about the artist "painting florals", please click here. 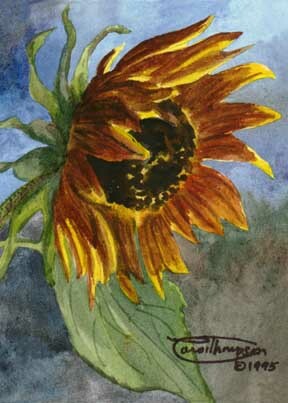 "Miniature Sunflower" is a limited edition, giclée print from an original watercolor painting by Carol Thompson. The edition includes 3600 authorized, signed, limited edition prints (3500 numbered and 100 artist proofs). Release date is November 1999. Image size and substrates vary. All prints are signed and numbered by the artist and include a certificate of authenticity. Paper prints are shrink wrapped on foam board. Canvas prints are coated with a protective spray.